Behold the Bogomol tanklet! Built by Belarus, this compact car-sized unmanned ground vehicle joins the growing ranks of robotic weapons designed for combat. We’ve seen some form of remote-control armored vehicle developed by everyone from Russia to Iraq, with a similar purpose shared by all armored vehicles: deliver pain to the enemy, all while keeping the humans controlling the vehicle safe from harm. That makes the Bogomol, also known as a Mantis, more of an ambush weapon than an independent asset. Still, the designers appear to be thinking of it as a weapon with a deadly reach far greater than its meager control radius. “The manufacturer claims that this UGV can spot and destroy targets many kilometers away,” says Bendett, noting that the Bogomol is also listed as having advanced communications systems including a companion multicopter drone, that can extend the communication range to over 6 miles. That’s promised performance, not proven, and as we saw with Russia’s Uran-9 robot tank in Syria, everything from range of control to stabilization of weapons can fall apart when tested in the field. Like with Uran-9, we should treat manufacturer claims that the Bogomol has a limited AI that enables it to distinguish camouflaged targets with serious skepticism. If the Bogomol doesn’t appear to be all the threat it offers, it still points in the direction of the future. And that’s one where robots, operated by concealed humans, can wheel into position to unleash a barrage of missiles at larger, deadlier, human-containing foes. 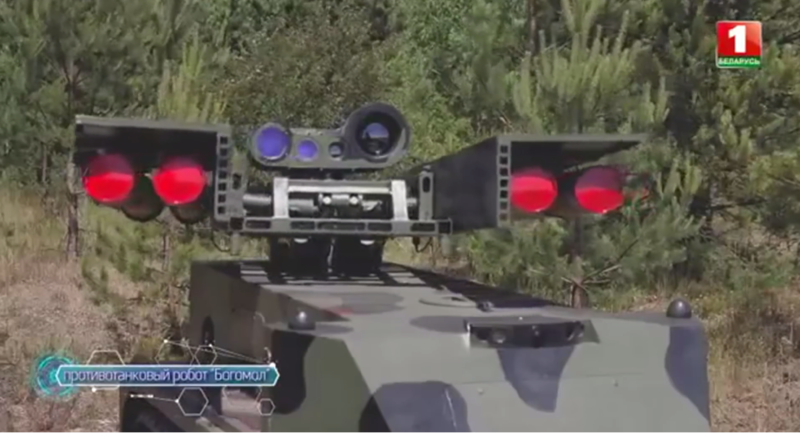 Bogomol is set to carry older design Fagot, Konkurs, and Metis anti-tank missiles, as well as possibly including the newer Shershen laser-guided missile. While broadly in the same field as the Uran-9, the Bogomol’s just around 1,700 pounds to the Uran-9’s 11 tons makes it a flyweight by comparison at best. When it comes to proving the robot in combat, Belarus will have to send the robot abroad to fight someone else’s wars.